Andrei Grebennikov earned his engineering diploma in radio electronics from the Moscow Institute of Physics and Technology, Russia, and his Ph.D in radio engineering from the Moscow Technical University of Communications and Informatics, Russia. He worked as an engineer, researcher, lecturer, and educator at Moscow Technical University of Communications and Informatics, Russia; Institute of Microelectronics, Singapore; M/A-COM, Ireland; Infineon Technologies, Germany/Austria; Bell Labs, Alcatel-Lucent, Ireland; and Microsemi Corporation, USA. He served as a guest professor at the University of Linz, Austria, and as an invited speaker at the IEEE International Microwave Symposia, European and Asia-Pacific Microwave Conferences; Institute of Microelectronics, Singapore; Motorola Design Centre, Malaysia; Tomsk State University of Control Systems and Radioelectronics, Russia; and RWTH Aachen University, Germany. A senior member of the IEEE, he has authored and coauthored eight books and more than 100 papers, and has 25 European and U.S. patents and patent applications. Narendra Kumar earned his Ph.D in electrical engineering from RWTH Aachen University, Germany. He worked in R&D at Motorola Solutions, USA, as a principal staff engineer. He has several U.S. patents, all assigned to Motorola Solutions, in the area of radio frequency (RF) and microwave amplifier circuitry. Currently, he is an associate professor in the Department of Electrical Engineering at the University of Malaya, Kuala Lumpur, Malaysia. He is also an appointed visiting professor at Istanbul University, Turkey. He has authored and coauthored more than 50 papers in technical journals and conferences, and two international books. He has conducted seminars related to RF and microwave power amplifiers in Europe and Asia Pacific. He is a fellow of the IET, a senior member of the IEEE, and an appointed member of the IEEE Industry Relations Team of Asia Pacific. Binboga S. Yarman earned his Ph.D from Cornell University, Ithaca, New York, USA. He was a Microwave Technology Center technical staff member at the David Sarnoff Research Center, Princeton, New Jersey, USA; professor at Anatolia University-Eskisehir, Middle East Technical University-Ankara, Technical University of Istanbul, and Istanbul University, all in Turkey; cofounder of I-ERDEC Maryland, STFA SAVRONIK, and ARES Security Systems, Inc.; chief technical adviser to the Turkish Prime Ministry Office; director of Electronic and Technical Security of Turkey; founding president of Isik University, Istanbul, Turkey; and visiting professor at Ruhr University, Bochum, Germany, and Tokyo Institute of Technology, Japan. Dr. Yarman has published more than 200 papers and four U.S. patents; has received the Young Turkish Scientist Award, National Research and Technology Counsel of Turkey Technology Award, and Man of the Year in Science and Technology of Cambridge Biography Center, UK; and is an IEEE fellow, an Alexander Von Humboldt research fellow, and a member of the New York Academy of Science. "… very comprehensive. Each chapter has a strong theoretical foundation. Working on those foundations, the authors provide detailed descriptions and practical examples of a range of power amplifier types. The chapter references are also extensive. … This book is a strong contender to become a standard text for advanced students as well as practicing engineers. 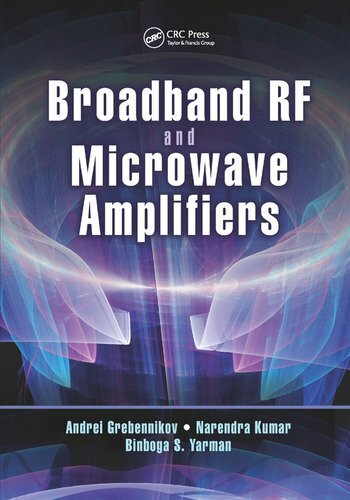 … certainly recommended as an addition to serious RF and microwave power amplifier designers and practitioners."